Charlotte Potter, Message Received, 2015, hand-engraved glass cameos, enamels, metal, 38'' x 30' x 4''. “Social,” a group exhibition of Charlotte Potter’s glass cameos, Ariel Brice’s ceramics, and Lucy Louise Derickson’s repurposed pewter, asks the viewer to reconsider communication and relationships in the digital world. 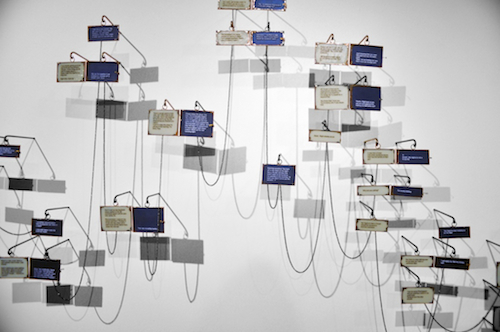 For example, Potter’s wall installation Message Received, 2015, is a series of cameo lockets and pendants that each open to reveal a text or a Facebook message between the artist and a former boyfriend, all connected by a looping metal-chain. The narrative follows the rise and fall of most romantic relationships, first stilted and formal, becoming more candid, followed by miscommunication, and finally, an uncertain future. A pile of necklace chain gathers on the floor after the last pendant marked with “. . .” While Potter critiques the so-called immediacy of digital communication, the installation’s appeal lies more in its ability to evoke voyeurism and the sentimentality of historical ephemera. Derickson’s I Look Forward to Seeing You Again, or for the First Time, 2015, consisting of 606 pocket-size pewter vessels—each corresponding to a specific Facebook friend of the artist—placed on individual wooden mountings, addresses object fetishism. She invites her friends to take an object—housing a personalized note from the artist, only retrievable after destroying the work—and pose for a picture with her. The picture is then posted online, available to viewers through a QR code. Together, these pieces poignantly consider the traps, benefits, and emotional investment of any community—IRL or digital—to provoke a reckoning with the value of the people in our lives.